Hey Coaches, Sparksy here again, a week late thanks to the joy that is university! As some of you would know, I write about players that provide a heap of value, whether that would be a mid-priced player in good form or a premium who had a shocker a few weeks ago and is now extremely cheap. Later in the season however, I focus more on players of difference, or PoD’s. This late in the season most coaches are looking for ways to make up points, either for making up rankings or winning those league finals. So, without further ado, I give you some players from each position that few people know about! Jack Crisp ($688,000 Avg. 93.6 BE 101 Ownership – 4.81%) – Crisp has been on fire lately, running free across the half-back flank and accumulating like there’s no tomorrow! Round 12 was his first score below 100 in 5 weeks and it was a 99, pretty impressive consistency for a bloke who is on almost nobody’s radar. Crisp is only in 6,650 teams despite having a Last 5 average of 117.6, the highest Last 5 of any Defender. Unfortunately, this is now reflected in his price, but Crisp is worth every cent, especially if he keeps this up. Over this five-week period he has averaged 29.4 disposals, 7.6 marks and 5.4 tackles, these are insane averages for anybody, let alone a player who people pay little attention to. He may be a touch expensive, but Crisp seems to have locked himself in as a Top 6 Defender and will reward you with consistent 100+ scores. Connor Blakely ($612,000 Avg. 91.5 BE 87 Ownership – 2.62%) – Although he has the bye this week, Blakely is number 2 on my list of PoD Defenders due to his surprisingly low ownership levels. Blakely has been talked about all season and most of last least and yet less than 4,000 teams own the Fremantle half-back. Why? Well, I think it’s due to his consistency. Most of us are aware of what Blakely is capable of, whether it be through owning him last year or seeing him dominate some matches this year. However, Blakely has been the new Yeo-Yeo this season and the reason for his up and down scores is his role. Surprisingly, Blakely actually struggles when he gets a run in the centre of the ground. His big scores come from playing on a wing or across half-back and finding the loose ball and intercept possessions rather than being placed in the thick of things. The disparity between his big scores and his low scores lies in his disposals and his marks, because he finds it much harder getting his own ball rather than being given it by his teammates or the opposition. Blakely has five 100+ scores this season and six scores below 90, and the difference is extremely apparent. In his tonnes, Blakely averages 29.8 disposals and 9.8 marks, however in his sub-90 scores Blakely only averages 18.2 disposals and 5 marks, a HUGE difference all due to an unfavourable role. The big issue with this is that Luke Ryan plays a very similar role to Blakely and they seem to share this depending on where Ross needs Blakely to play. This is an issue for us as AFL Fantasy Coaches as we can’t rely on Blakely scoring well consistently because of this. If Blakely was able to play inside and outside as a midfielder I would be much more inclined to take the risk, but I think people have avoided him due to his apparent one-dimensional game style and the worry that his role might change to not suit us. Blakely is definitely capable of great scores and is an insanely good PoD if he can keep his favoured role but expect some shockers if you do pick him up. Alex Witherden ($565,000 Avg. 86.8 BE 72 Ownership – 2.48%) – One of my favourites, the baby-faced assassin Witho has been pretty solid for a second-year player. As much as Witherden hasn’t been amazing, he has gone under 70 just once and has had two 120+ games this year. Witherden is a cheap option for D6 and one that I usually like to avoid unless desperate, however his consistency really helps his cause. Alex is good for a solid 80-90 each week, whereas some premos like Lloyd, Simpson, Blakely and Whitfield have tended to be a bit less consistent this season, slipping us Coaches that own them a few 60’s along the way. Although 80-90 isn’t an insane score, it is 80-90 points most of the competition won’t be getting, and if you upgrade an on-field rookie to him or if the premos have one of their bad weeks, you will enjoy the extra points and consistency even more. I wouldn’t recommend him lightly, if you have the money to get to Crisp/Sicily/Yeo or any other premium that isn’t an automatic lock then I would go them first. However, I definitely understand money can be tight coming out of the byes, so people might look to Witherden as a consistent place-holder until the end of the season comes nearer and you shouldn’t be disappointed as Brisbane have a fairly easy Fantasy run home. Tom Phillips ($685,000 Avg. 99.9 BE 108 Ownership – 2.97%) – Coming off the bye last week, Phillips has been the absolute epitome of a good PoD this season, and for anybody who already owns him, bravo. Phillips has absolutely everything going for him and I wouldn’t be surprised to see his ownership more than double in the coming weeks. To begin with, he has a dream run home, playing teams like Carlton, Gold Coast, Brisbane and Fremantle before the season ends. Collingwood are also in reasonable form and a big part of this seems to be the players gelling together nicely, which has seen an increase in output across the board for Collingwood players, including Fantasy output. Phillips also has seven 100+ scores already this season, with four 120+ scores, so his ceiling is extremely solid. The only problem I can see with Phillips is that he seems to be a slightly better Connor Blakely, in that he has some absolute stinkers but not as often as Blakely. Five times this season Phillips has been below the ton and four of those scores are below 75, so when Phillips has a bad game, he has a really bad game. However, the positives far outweigh the negatives in this case and I’m strongly considering bringing Phillips in instead of Kelly this week to make up some ground. Expect maybe two more of those sub-par scores this season, but I’d also expect a few more 120+ scores that less than 3% of the competition is currently benefiting from. Definitely one for those chasing rankings. Ollie Wines ($643,000 Avg. 95.8 BE 58 Ownership – 5.1%) – Wines has had an interesting season so far this year, but it seems to be looking up. Traditionally a safe pick as an AFL Fantasy player, Wines has sprinkled in a few poor scores this year to bring his average down slightly. He seems to be picking it up now however, with two scores in the 130’s in the past two weeks, rewarding anybody who jumped on the Port Adelaide midfielder to have one less problem throughout the byes. The best thing about these two scores is that they’ve come about not through a change in role, but through a change in effort. Between Rounds 1-11, Wines averaged just 3.7 tackles, extremely poor for a player who is renowned for his size and bullishness through the midfield. In the past two weeks however, Wines has really picked up those numbers, averaging 9.5 tackles in two games! He is owned by 5% of the competition so he’s not entirely unique but considering his lacklustre start to the season it can be assumed that these Coaches are not the higher-ranking ones, meaning picking him up now and capitalising on this new-found effort could lead to some solid ranking increases for owners. At the very least owners will have a player capable of making a difference throughout their league finals. Taylor Adams ($614,000 Avg. 86.1 BE 91 Ownership – 1.41%) – He’s one that I don’t particularly like the look of, but Adams is just too cheap and has too low of an ownership to not mention. Last year’s star Defender has had a rough season thus far, struggling to get on the field and then struggling to find any form when he has played. His Last 3 and Last 5 averages are slightly more respectable at 97 and 98.6 respectively, however they’re certainly not the Taylor Adams of old and there’s no sign of things really turning around for Adams. There are three reasons Adams finds a spot on this list: History, value and fixture. Although Adams hasn’t been great so far this season, his scores in the past show us that he is capable of doing a lot better if he can find form, and if he does find this form he’s a complete steal. At $614k, Adams will be worth every penny if he starts firing. Remember, he started the season above $800k. Lastly, as I already mentioned when talking about Phillips, Collingwood’s run home is absurdly easy, which hopefully means Taylor can find some form! I’m going to stay away because my team is already full of so many mediocre scores that I can’t afford to take a risk, however if Adams goes 120 this week against Carlton I will strongly consider for next week. Patrick Ryder ($546,000 Avg. 77.1 BE 68 Ownership – 3.61%) – After an extremely stilted start to this season because of injury, Ryder has finally found some mild form, averaging 92.3 in his last three games. I want to begin by saying that Ryder is only being mentioned because he is so cheap. All Coaches really should have a combination of Gawn, Martin and Grundy if they don’t want to be missing out on too many points. I understand that they are quite expensive and might be difficult to reach if you don’t already have a combination of two of the three, however even grabbing Ryder instead of the Big 3 will probably lose you 20 points a week, so spend the extra cash wisely. Ryder has been dominating hit outs for the past four weeks but it’s the increase in his stats around the ground that have caused his Fantasy scoring to become once again respectable. He seems to be slowly progressing through his achilles issue and working his way around the ground again, increasing his disposals and marks in the last few weeks. My main concern about Paddy, other than the fact you’ll be losing points by picking him, is I seem to recall someone at Port Adelaide mentioning he won’t be 100% for the rest of the year, and so they will give him Time on Ground accordingly. Ryder definitely presents some value, but you really need to gain significantly elsewhere to warrant not spending up. 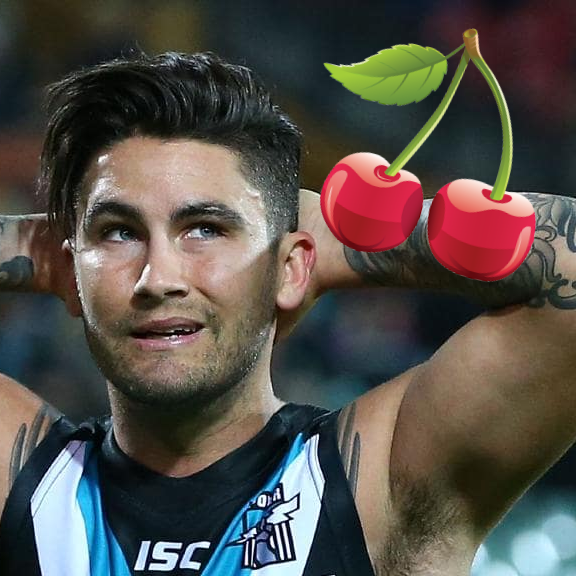 Chad Wingard ($514,000 Avg. 74.7 BE 32 Ownership – 10.13%) – Although his ownership numbers are fairly high, Wingard is currently the best value pick in the competition and deserves top spot in this article. Due to a role change which sees him lining up dead in the centre of the ground, Wingard has averaged 122.5 Fantasy points and 30.5 disposals over the last two weeks; a phenomenal increase from the rest of the season! This huge scoring after such a long poor spell has made Chad not only extremely cheap, but his Breakeven is much lower than his lowest score this season, meaning you can get him risk free! My biggest fear is the same fear I have every time I pick a Port Adelaide player: Ken Hinkley. Hinkley is the bane of every Fantasy Coaches existence, constantly changing roles to ruin Fantasy scoring trends, and he especially loves messing with the MID/FWDs on his team. He has successfully ruined Wingard, Rockliff and Robbie Gray at some stage this season and it seems like there’s not enough ball for the three of them all to prosper. It seems as though Gray is on the outer at the moment, but that could all change in a flash. This uncertain in role is the only thing that makes Wingard not a lock, and even makes him a risky pick. For now, he seems safe and you can enjoy bringing him in at a cheaper price than Bayley Fritsch and watching him dominate, but beware as Hinkley will eventually haunt you, I’m sure of it. Just quickly, I mentioned Rockliff ($570,000) in my last article and he still seems to have it, but the same problems that plague Wingard also effect Rocky, so buyer beware on them both. I’d go Wingard over Rockliff purely for the extra cash, but both are great options! Jake Stringer ($497,000 Avg. 72.3 BE 20 Ownership – 3.08%) – I may have completely lost the plot here, but Stringer has been stringing together some solid football! (Pun intended) The new Don is averaging 98.3 in his Last 3, including a high score of 133. Despite never being particularly Fantasy relevant, I’ve always believed Stringer could score well, and a move into the midfield has shown us just that! The biggest problem I have with Stringer is that he really needs to hit the scoreboard to go big as his disposal count and other stats don’t usually pad his score. The good news is he usually does kick a few snags, with 17 goals to his name for the season! I certainly understand any trepidations Coaches might have slotting Stringer into your side, but he has a bunch of positives about him! He’ll save you some cash, has a low Breakeven, low ownership and he seems to have worked out a positive role in his new side. Certainly not one for the faint of heart, but the risk could certainly pay off if Stringer keeps this up! Daniel Rioli ($383,000 Avg. 82 BE 42 Ownership – 1.06%) – He’s on his bye this week, but he’s also extremely cheap, fresh on the park and nobody owns him! Rioli is pure value, being and easy downgrade for any fattened cash cow and providing you with some sense of security as you know what he’s capable of. Realistically, Rioli is capable of averaging 65 for the rest of the season, which is still an increase on his current Breakeven. He reached 82 last week purely through great tackle numbers and could do this easily most weeks due to Richmond’s structure. The best thing about Rioli is definitely his price though. Rookie options are currently pretty scarce and Rioli could be a quick cash grab for any maxed-out rookie, netting some money now whilst making you more in the coming weeks. Don’t expect any massive scores from him, 80-90 is probably the best he can do, however he shouldn’t go below 60 too often and will definitely increase on his current worth. That’s the end of this week’s article! Sorry it was a week late but sometimes life gets in the way of things! If you have any questions, leave a comment below or hit me up on Twitter @SparksyDT and I’ll do my best to get back to you! I’ll be back in a few weeks with some more PoD’s! Until then, happy trading! Thanks for the one week Redman. Ideas for which of the following premium defender to bring in? I would go Treloar, for the safety he offers. Kelly may be a bigger scorer but I feel a little uncertain about his availability later on, however at that time you would get the luxury of straight swapping. josh kelly as compared to wingard better option and likelyhood to play rest of season?